A document by Arthur "Jimmie" W. Sinclair, executive secretary of the Winter Garden Chamber of Commerce, discussing his planned comments at a public hearing on water pollution held in Orlando Chamber of Commerce building on November 14, 1966. The document gives a timeline of pollution discharges into the lake, and recommends as solution the development of catch basins lining the north shore, and planting of vegetation to act as a buffer zone. 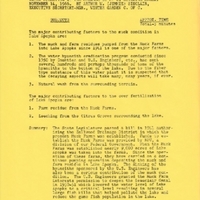 Original document by Arthur W. Sinclair: binder 1966, Friends of Lake Apopka Archives, Ginn Museum, Oakland Nature Preserve, Oakland, Florida. Digital reproduction of original document by Arthur W. Sinclair. Sinclair, Arthur W.. “Subjects to be Presented at Public Hearing on Local Water Pollution.” RICHES of Central Florida accessed April 22, 2019, https://richesmi.cah.ucf.edu/omeka/items/show/6840.